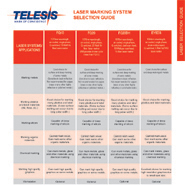 Telesis Technologies, Inc. is a leader in Product Identification and Traceability Technology. Our wide range of permanent, programmable, laser marking systems, PINSTAMP® / BenchMark® dot peen markers, and Telescribe® scribe marking systems are fast and durable. They are relied on by thousands in industrial manufacturing environments every day, throughout the world. ALL Telesis systems - whether standard or custom engineered - are backed by a global network of knowledgeable Sales and Service Professionals. C-Series CO2 Laser Marking Systems Proven CO-Series CO2 RF-excited, sealed-tube laser marking systems provide a galvo-steered beam designed for marking. The CO-Series laser marking systems are excellent for marking substrates like wood, glass, Plexiglas®, quartz, ceramics, fabrics, and other organic materials. E-Series Vanadate YAG and vanadate laser markers offer improved beam quality, increased depth of focus, and higher peak powers compared to fiber lasers - for fine marking, heat-sensitive materials (metal foils, silicon, plastics, etc. ), and applications where higher consistency is required.